… and where was I? In a land of enchantment, a garden most gorgeous, a plain sprinkled with coloured meteors, a forest with sparks of purple and ruby and golden fire gemming the foliage; a region, not of trees and shadow, but of strangest architectural wealth-of altar and of temple, of pyramid, obelisk, and sphynx; incredibly to say, the wonders and the symbols of Egypt teemed throughout the park of Villette. I found myself encompassed with clouds and darkness. 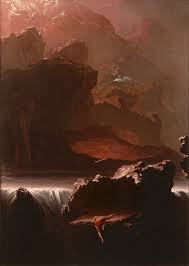 But soon the roar of mighty waters fell upon my ear, and I saw some clouds of spray arising from high falls that rolled in awful majesty down tremendous precipices, and then foamed and thundered in the gulf beneath as if they had taken up their unquiet abode in some giant’s cauldron. 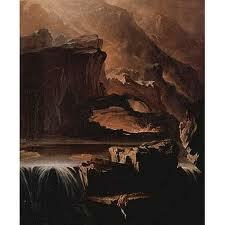 Charlotte Brontë was familiar with John Martin’s paintings – or was she really? The Brontë sisters became acquainted with Martin’s works through the reviews published in Blackwood’s Edinburgh Magazine and their father, a keen admirer of the painter, bought mezzotints of Belshazzar’s Feast and Joshua Commanding the Sun to Stand Still among the others. The sky covered with dark clouds, the flood rushing from it and the flash of lightning, which almost dazzles your eyes, is sublimely awful and sets both in grand relief: the bright spirit standing on the rock… a more magnificent picture was never painted. In An Edition…, I, 64-65. Martin’s visions seeped into Brontë’s words in spite of the lack of an actual encounter. I’m interested in how Brontë’s words take shape as she was removed from the actual experience of ‘the’ paintings – she formed an impression of them through other words, or through prints. What matters is not the idea of a permanent original, but what is shaped after it – where? by whom? What matters is how it’s embodied again, and constantly reshaped in the presence of every now. I’m interested in the state of ‘being removed from’ in the writing of an encounter, which is also the writing of the anticipation of another encounter. Something has been there but can’t be regained. It can only be shaped in a different form which is also the form of an erosion. I’m interested in the ceaseless questions about a where and a who that arise in this cohabitation of eroding and reshaping through words. And what happens when it’s not pictures, but sounds, that are eroded and reshaped in words?